Aboriginal leader Michael Anderson talks about important contemporary issues such as resistance to the invasion, Stolen Generations, walkabout, religious beliefs, spiritual importance of land, artistic expression of the culture, the exploitation of Aboriginal art and many more. Michael Anderson (Nyoongar Ghurradjong Murri Ghillar) is an Aboriginal rights activist, leader of the Euahlayi tribe of 3,000 people living in north-western New South Wales, and Native Title claimant to their traditional lands on their behalf. 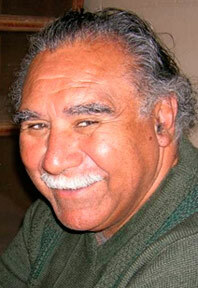 From 1969 Mr. Anderson was a leader in the Australian Black Power movement and was appointed by his peers as the first Aboriginal ambassador to white Australia after he and three comrades established what was later called the Aboriginal Tent Embassy on the front lawns of Australia's parliament house in 1972. He was taught Euahlayi customs and traditions through his people's sacred ceremonies. In 1979 he was appointed to the Office of the Public Prosecutions in criminal law as an instructing officer (the equivalent of a solicitor) in the state of New South Wales. Mr. Anderson has lectured in Aboriginal studies and Aboriginal politics at several Australian universities, writing and teaching units in Aboriginal studies that were inclusive of traditional Aboriginal society. He is the National Convenor of a new political movement in Australia that is promoting worldwide the continuing sovereignty of indigenous peoples. Mr. Anderson is also involved in connecting the sacred songlines of the ancient traditions of Aboriginal peoples around the world in an attempt to prove that they have a Dreaming that links them to the original creation. Mr. Anderson has also played professional Rugby League football, a game not too dissimilar to the American Grid Iron. He also paints in the dot technique. He lives on and runs a sheep and cattle property on his ancestral lands on both sides of the New South Wales and Queensland border in the lower Ballone river system. Adelheid Farid conducted it in December 2000 for Senioren Medien Forum, a citizens' radio station in Bonn, Germany. These files are ZIP archives containing mp3 files. The German translation is voiced over the English original. All files are ZIP archives containing mp3 files. Please note that the copyright of the interview remains with the Senioren Medien Forum in Bonn.